Participating in a sport can be an intense experience requiring a lot of practice. There are some sports like kneeboarding that have a lower learning curve making it easier to master. With the right equipment, anyone, including kids and youth, can get out on the water and have a blast with a kneeboard. Kneeboarding is also a great sport for advanced riders where you can learn tricks and spins if you have the right type of board. Knowing the difference in boards and how you use them will have a big impact on your ability to learn or do advanced techniques. Here are a few tips on what to look for in the best kneeboard and a few reviews to help you start shopping. Recreational: Less expensive and more widely available than a competitive board, most of the recreational boards available are constructed using rotational molding. Providing wide and soft edges, a board made with rotationally molding are a great choice for those just starting to learn to kneeboard giving them sustained control and smoother turning. They are also more buoyant due to their relative thickness so they also work as a good flotation device after a fall and often feature fins that give you easier turning. Competitive: Manufactured with compression molding, competitive kneeboards give you better performance and durability that competitive riders need. They are also thinner and lightweight with sharper edges allowing for better tricks and faster turns. Less buoyant than rotationally molded boards, a compression molded board is geared for the advanced rider who looks for deep-water starts. These pro kneeboards are ususally a bit more expensive and less ideal for those starting out. No matter what level you are at, you will find only two styles of kneeboards, and they basically differ on what you plan to do with the board in the water. Slalom Board: With sharp edges, slalom board gives you better overall turning with increased edge-hold through a turn. They are also specifically designed for use of slalom boarding. Trick Kneeboards: With a trick board, you get a round bottom and round edges making it easier to perform tricks. Similar to a kayak or a paddle board every part of a kneeboard will affect its performance so it is important to know what to look for in each of these features. Materials: Usually constructed with a plastic, foam core, or polyurethane, kneeboard materials are usually the same that are used to make water skis. The exterior is usually either fiberglass or a fiberglass/graphite composite that is most often used on an advanced board. You will find the most commonly used material is plastic which is a durable material and can withstand wear and tear, especially if you have a beach start. 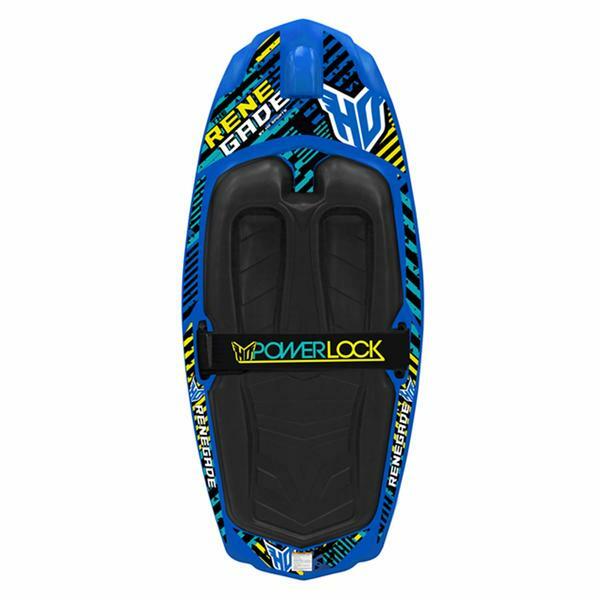 Foam filled roto-molded polyethylene creates a kneeboard that is more buoyant, forgiving, and flexible which are all great features for a beginner. Fiberglass Kneeboards made of compression molded fiberglass are higher quality boards since they are constructed similarly to how wakeboards and slalom water skis are made. Since fiberglass creates a thinner but stiffer board, it will perform better than a plastic kneeboard giving you more speed, better edges control, and delivering more of a pop off the wake. Fiberglass is often preferred in a kneeboard by people that like having a less buoyant board which makes a deep water start easier. Timber kneeboards are pretty new to the market and follow the same construction techniques that you see in cable wakeboarding. This type of board has a similar thin profile seen in a fiberglass board but they give more of a spring for take-offs and are a little easier on your knees for a softer landing. Timber boards also feature reinforced edges which handle wear and tear better than fiberglass boards. Fins: You may or may not see a kneeboard with fins on a recreational board, but if you do, they will be found underneath the board to make it easier to steer. They are usually made of a fiberglass composite or hard plastic materials. Rocker: Used to compare the speed of a kneeboard, the rocker is the curve’s measurement under the kneeboard. With a high rocker number, you will have a board this is easier to turn while a low rocker number means a faster board with the lower the number indicating the faster the board. Most commonly you will see a rocker measurement between five to six centimeters. Requiring a stiffer rope than those used for waterskiing, a stiff kneeboarding rope helps the rider perform tricks. In comparison, the ropes and handles that are used for wakeboarding are better to use with a kneeboard than those used for waterskiing. When choosing the right rope, it is vital to understanding the need for a stiffer and tighter rope that will not stretch that is perfect for catching more air. Plus, the characteristics of the rope will help you pull through spins and flips. Ropes used when waterskiing has about three percent stretch while there should be almost no stretch in a kneeboard or wakeboarding rope. No-Stretch: Typically made from a material called Spectra, a no-stretch rope is very durable and has pretty much no elasticity. A rope that will not stretch makes it perfect when kneeboarding. Spectra Rope will not absorb a lot of moisture which is great when used in the water keeping the rope light and not increasing your fatigue when holding onto the rope handle. Low-Stretch: Usually made of polyethylene or a polyethylene blend, a low stretch rope gives you more elasticity then you will get in a no-stretch Spectra rope which is perfect for a recreational user. Multi-Purpose: For those users wanting to work on doing tricks, you will want a no-stretch Spectra rope. If you like to both recreation kneeboard and waterski, a low-stretch rope is the best type of rope to choose. It should give you just enough elasticity when you are waterskiing recreationally and also have the required stiffness for recreational kneeboarders. Rope Length: You will want a rope for your kneeboard that falls between sixty and seventy feet in length, but you will find that rope length varies from board to board. Beginners will need a longer line as they learn as well as one that can stretch. Kneeboard and wakeboard lines will have a section in them so you can shorten them allowing the rider to make jumps when they are advanced enough. Follow the below video to learn more about choosing the right rope length. Handles: Kneeboard handles are more specialized in comparison to waterskiing handles giving you more features that make doing aerials and tricks easier. The handle on a kneeboard will also have a wider grip than a waterskiing handle and range in width from thirteen to fifteen inches. If you need to, wake handles measure fifteen inches so they are fine to use with a kneeboard. Waterskiing handles only usually measure between eleven and twelve inches wide. A wide grip on the handle will help you do tricks because of the need to pass the handle behind your back. There are features on the handles that make it easier to do spin tricks like a second smaller grip on the handle or a rope braid that is built into the rope. Wider handles also are easier to use when making handle passes and when you are attempting a 360. Usually made of neoprene foam, this helps a handle float since the slower speeds that kneeboarders travel at in comparison to waterskiing keep the floats from ripping off in the water. The foam is located near the handle while you will notice that most handles on water skis slowly sink. The perfect speed for kneeboarding depends entirely on the skill level of the rider. With children, you want to be under ten miles per hour while an advanced rider can handle speeds over twenty miles an hour. One advantage of increased speed is the rider can look forward to bigger jumps with the larger wakes increased speed creates. A slower speed will help a beginner transition to kneeling from lying down on the board and is in a riding position that is comfortable. At that point, the boat can increase the speed, but only after the rider is comfortable and ready. How is Kneeboarding Different From Other Water Sports? Many people that are already wakeboarding and surfing decide to try out kneeboarding. They quickly find out that it is a unique experience different from other water sports. – There is a lower learning curve with kneeboarding that the other watersports making it less intimidating for a beginner. – You will work out different parts of your body kneeboarding and find strength in new muscle that you didn’t even know existed. This increased muscle strength can carry over to other sports. – Wipeout impact is also reduced since you are closer to the water making this a safer sport since it gives you softer crashes. – Younger kids will enjoy it as a great introduction to water sports. – You eventually can learn techniques and tricks as you master the sport. – This is an especially good sport for beginners and kids since it has easier wipeouts, a lower learning curve, a flexible skill cap, and users benefit from the ease of balance. Hold the sides of your board and your hook as you lay flat on your stomach. As the boat starts to move, position your knees into the board’s kneepads. As the boat picks up speed, lean back when you are ready into a firm kneeling stance. At this point, you can take the handle from the hook and hold on tightly as you stretch out your arms making sure your palms are facing down a few inches apart. As you ride, steel yourself by tilting your body in the direction you need to go. Make sure to be patient and steady so you soon feel comfortable. As you skill improve, you will soon begin to have more fun as you become more confident kneeboarding. Below is a helpful video for beginners that shows the steps to start riding. If you are a beginner, a recreational kneeboard is the best choice as they are really just a little more difficult than the basic tube that gets pulled behind a boat but not as hard as wakeboarding. For those only interested in advanced performance, the competitive kneeboard is perfect since it won’t serve the needs of a beginner with their compression molded design, sharp edges, and lightweight, they may also have fins and rockers that can affect the turning and speed of the board. Classified by either trick or slalom, good kneeboards are one or the other despite being a competitive or recreational board. You get better riding and turns with a slalom board since a trick board has a rounded design that is perfect for flips or large stunts. Which is better is completely dependent on what you plan to do as a kneeboarder. Why Do You Want a Kneeboard Hook? The hook is vital for any beginner or kids kneeboard so that they can be pulled along by a boat as they learn to hold the tow rope safely. You will find a hook on any quality beginner kneeboard and as you become a better rider, you won’t need to use it. Helping a rider get securely up on the kneeboard, the hook should be a requirement for any board that you buy if you are either a beginner or even intermediate user. You will also notice that kneeboards that are more advanced do not come with a hook so avoid those if you are just starting out. Depending on the brand, a hook may be molded permanently into the board and have edges that are rounded for safety reasons. Others may be spring-loaded giving the user an easy location in the rope handle. Remember that the hook itself will not cut you or even catch you if you fall because it will be flatly inserted into the kneeboard’s deck. Below is a helpful video to help you understand how to use a kneeboard hook correctly. With a cross-section that features a low-profile and performance edges, the O’Brien Voodoo Kneeboard mixes a forgiving ride with hard-charging edging. Each corner of the hull has a molded fin giving you more tracking control and edge transitions that are smooth and quick with the curved underside. You also get a padded strap that gives you great control and a ¾-inch thick pad that gives you knees luxurious comfort. With its unique features, the O’Brien Voodoo kneeboard is constructed to optimize performance featuring a contoured kneepad that allows your knees to have a firm grip so you won’t slip off. Utilizing a smooth and soft material, the kneepad is designed to lessen discomfort and allow you to hold on without injury. This is a great kneeboard that rides well and is great for tricks allowing you to master them with ease. The Voodoo is a great kneeboard for beginners or anyone learning to make harder jumps or do tricks. Even if you are an experienced user that likes a high-performance board, when you consider the versatility of the board for any level rider, it really is a great value. With its great features, riding the Voodoo feels very natural making it a great kneeboard for both adults and kids and riders of any skill level. Affordable and versatile, the O’Brien Voodoo Kneeboard outperforms other boards on the market. Other features include deep knee wells, variable beveled edge, a padded strap that is adjustable, a ¾ inch EVA pad, and an integrated hook that gives beginners stability and security. With performance and comfort in one stable kneeboard, the Voodoo is perfect for beginners and anyone that wants to take it all the way. Perfect for a beginner, the Leader Accessories Kneeboard is packed with features that are great for those that are just learning. Beveled edges combined with integrated fins give you the best control over your movements and allow you to effortlessly skim through the water. It also gives you more balance since you are even closer to the water’s surface and, with ¾ inch EVA padding, it is durable and comfortable for your knees. With the padding on the strap of the Leader Kneeboard, you won’t have irritated legs when they are locked in tight. The compact and lightweight board is perfect for recreational boarding and also comes with the hook that beginners need. Featuring rotational molding and universal fitting construction, this kneeboard is available in four different colors that all include cool graffiti styling. This is an easy to transport and travel with a board that fits well into vehicles and is also very easy to carry. The ergonomic knee pads make it comfortable to sit on that is also very durable and sturdy providing the most control. Unlike cheaper boards on the market, the Leader Kneeboard works for any level rider that also features outstanding craftsmanship and comfort that both beginners and advanced riders will appreciate. The three-inch straps give you comfortable knee stabilization, and, with the beveled edges, you can cut smoothly with hardly any resistance giving you a low-profile ride so you achieve better stability. Since safety is a huge consideration with any sport, stability is key and this board covers all the bases from a hook for beginners to beveled edges for smoother cuts that advanced riders will appreciate. The Leader Accessories Kneeboard is an affordable, high-quality board that is great for any level user. Water sports can be a fun summertime activity and finding one that has a low learning curve that is also good with kids can be hard. Kneeboarding can be a great summertime activity for any family as long as you have the right equipment. The HO Sports Neutron Kneeboard is a great choice for any level rider that is not only affordable but comes with a comfortable design. With tons of features, the HO Sports Neutron Kneeboard is a high-quality board that is a best seller and is highly recommended by users. Utilizing a unique structure, the Sports Neutron incorporates a lot of features so it can perform to the user’s expectations. Using HO Ski’s V-Bottom Technology, it employs features that let you cut through shallow or deep water efficiently. Giving you great stability on the water’s surface so won’t stagger around as you ride, the Sports Neutron uses a set of skis which help beginners start to train themselves to do kneeboarding. With incredible versatility, you also get the capability to perform tricks that are easier to do with the Sports Neutron than with others on the market. Perfect for beginners as well as professionals, the versatility and flexibility of the board make it a great choice for any level of user. Making it easy to ride and spin effortlessly, the Sports Neutron has a design that features a diamond tail and tip for fast and easy releases off of the wake. You also get the most control and stability with four molded fins that are fun for beginners and also allow professionals easier maneuverability, plus the orthotic knee pad is large and comfortable giving you a soft landing so you can stay on the board longer. For beginners, the HO’s Powerlock has a single-lock strap that includes soft padding for additional comfort. the locking stray is intuitive and easy to use keeping the user secure and safely strapped in. When summertime comes around, everyone is ready to hit the water to have a little fun and to cool off. If you are out on the water with your family, having a kneeboard that works for both adults and kids is a great choice. A lightweight and versatile kneeboard like the SereneLife Kneeboard is compact enough to load up in the car and light enough that a small child can carry it. If you are a beginner looking to start a new adventure, the SereneLife Kneeboard has a hook that is specifically designed to hold onto the tow rope handle as you learn. This is a great board to use while learning the basics as you begin your journey to becoming a pro. It is also a good choice for kids to use as they learn with a kneeboard that is cushioned, plus with its universal design, adults and teens will enjoy using it as well. Constructed of corrosion-resistant and marine grade water-resistant materials, the SereneLife Kneeboard is a water-safe board that has a stable, floating platform base, plus it is strong enough for use by professionals. You also get a hassle-free setup with this lightweight board that only weighs just under nine pounds. The adjustable straps make it a great board to use if you are cruising the river, surfing on the lake, or just doing fun boat activities. The form-fitting knee slots are comfortable and fit any size user. Measuring twenty inches wide and fifty inches long, the board is also a great fit for all ages. The SereneLife Kneeboard is easy to transport, won’t bog you down in the water, and is the perfect size to fit in a boat box or your vehicle’s cab. With its great performance record, the O’Brien Ion Kneeboard is highly recognized as a top product in the kneeboard market. It is well known for how well users can slide on top of the water with great control and incredible stability. When you are riding the Ion Kneeboard, you don’t have to bend side to side to stay in control which you will appreciate once you learn how the Ion rides. The Ion also features a unique design and color pattern that allows you to be patriotic as you have fun. This all foam board features a great shape, an adjustable strap that is padded, and deep knee wells that are shock absorbing making it a great value for the high performance you can achieve. Weighing only sixteen pounds, this lightweight board also features bevels that are hand turned along with a progressive rocker line. The Ion uses an innovative sandwich construction technology as well as flexible and lightweight foam. With its flexibility, you get a very fast and forgiving board that is easy to maneuver allowing you to set edges, make easy turns, and have soft landings. If you plan to do some aggressive riding, this is a great choice with its progressive rocker line, shock absorbing deep knee wells, and its hand turned bevels. Not a good choice for beginners, it does have a higher learning curve than most boards so it is really designed for riders with intermediate or advanced skills. The clear winner of the best kneeboard roundup is the O’Brien Voodoo Kneeboard. Featuring a cross-section that with a low-profile and performance edges, this Kneeboard mixes a forgiving ride with hard-charging edging. Each corner of the hull has a molded fin giving you more tracking control and edge transitions that are smooth and quick while the padded strap gives you better control and a ¾-inch thick pad gives you knees luxurious comfort. Constructed with unique features, the O’Brien Voodoo kneeboard optimizes performance while the contoured kneepad gives your knees a firm grip so you won’t slip off. Utilizing a smooth and soft material, the kneepad is designed to lessen discomfort and allow you to hold on without injury. This is a great kneeboard that rides well and is great for tricks allowing you to master them with ease. Affordable and versatile, the O’Brien Voodoo Kneeboard outperforms other boards on the market with its stability and security. This is a great kneeboard for beginners and anyone that wants to take it all the way making it the clear winner of the best kneeboard roundup hands down.